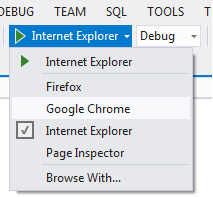 In this article we will discuss about how we can change the browser while debugging application. It is different from visual studio 2010. - What are different types of results in MVC? Previously only Browser icon appears while we trying to debug. 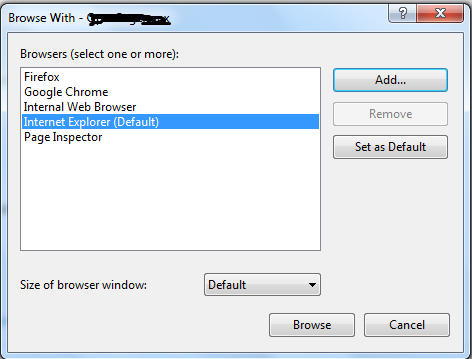 But in Visual Studio 2012, there is a option to browse with different browser. Follow the figure below. Similarly if you want to add a new browser then click on Browse with... This will open the Browser with dialog box as shown in the figure below. It shows all the browsers as well as option to Add new browser. To add a new browser click on Add.. And this will open the Add program dialog box as shown in the figure below. Provide the Programs, Arguments and Friendly name and click on OK.